Mūlamadhyamakakārikā, or Fundamental Verses on the Middle Way, is a key text by Nagarjuna, one of the most important Buddhist philosophers. It now stands at the centre of modern philosophical analysis of the Madhyamaka philosophy, which is rapidly proliferating to match the rich and varied commentarial tradition that the text has accumulated over the centuries since its composition (most likely in the 2nd century). The argument is unusually susceptible to interpretation, as it is expressed almost wholly as a series of often cryptic refutations. We may classify the divergent treatments of the Madhyamakakārikā under three headings: those presenting the text as an appendix to a previously established philosophical tradition, those reading the text as a poem to subsequent philosophical developments, and those that would present it as philosophical teaching unto itself. For a brief example of each, we may consider that the modern Theravādins have represented the text as a mere recapitulation of early Buddhist anātman-theory (i.e., the Buddha’s rejection of a transcendent self), various Mahāyāna schools have regarded the text as the basis for their metaphysics (as with the Yogacara in India, or the Hua-Yen in China), and the Prāsaṅgika school (led by Candrakīrti) regarded the Mūlamadhyamakakārikā as a definitive manual on method, allowing of little in the way of further development and taking little interest in text’s sources in the Śrāvaka Sutras. It is to be observed that Nāgārjuna’s other works are not nearly so constrained in form, and have not been given a place of equal prominence in modern scholarship. This is sometimes attributable to misgivings over the authenticity of other texts (many of which are not extant in Sanskrit), but is sometimes due to sectarian biases. The openness of the Mūlamadhyamakakārikā to interpretation and re-interpretation has garnered the interest of diverse religious and secular schools, and has at the same time fostered a reluctance to interpret it in light of the same author’s other, less ambiguous writings. The tentative or merely conventional nature of all truth (MMK#22:11). 18. Ātmaparīkṣā: Analysis of the soul. To some extent the refutations that comprise the bulk of the text may be supposed to have been intended for the benefit of definite, historical schools of opponents. The amount that we may know about Nāgārjuna’s contemporaries will remain limited, and it is reasonable to suppose that Nāgārjuna largely made his opponents’ doctrines a convenience for unfolding his own, as he took no trouble (in this text) to give a balanced view or summary of what he argued against. 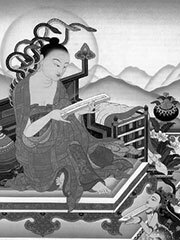 Most commonly, we have only a few words of each objection from the interlocutor before Nāgārjuna proceeds to refute the error at length. The extent to which the author may have misrepresented his opponents out of convenience may never be known. Some portions of the Mūlamadhyamakakārikā certainly appear to have been polemics against the ontology (and cosmology) of the Māha-Vibhāṣa-Abhidharma-Śāstra, and others seem to target the Pudgalavāda school. The influence of early Lankāvatāra texts may be surmised, but the paucity of early manuscripts of the latter has left its historical significance open as another matter of speculation. It may also be the case that Nagarjuna considered himself part of the longstanding Buddhist tradition of composing manuals of the correct answers to common questions from laypeople, and refutations of false views directed at monks by skeptics, or members of rival religions. «Manuals» of this nature are found in Abhidhamma, as well as in quasi-canonical works such as the Milindhapanha («The questions of King Menander»), and are prefigured to some extent in the Suttapitaka by tracts such as the «Brahma’s Net of False Views Sutra». Thus, we must leave open the possibility that Nagarjuna had no specific opponents or rival schools in mind, but instead composed the verses as a memoriter «manual» to prepare students or monks for debates, questions, or fallacies they might encounter from various camps, within or without the Buddhist community. The Madhyamakakārikā provides us with a theory of knowledge and a «critique of reason». Those who have read the text as a philosophy unto itself (e.g., the Prasangikas) have emphasized the extent to which understanding the limitations of knowledge and reasoning precludes the need for metaphysics or even for «truths», «standpoints», and other certainties. For the Prasangikas, all teachings are merely conventional. Their predominant method of argumentation is by reductio ad absurdum, «prasaṅga» in Sanskrit. For them, the exposition of śūnyatā is merely a way of pointing to the absence of any essence or foundation, whether in terms of metaphysical substance or in terms of epistemological truth. However, many Mahayana schools have made this very teaching of emptiness the basis of their systems of speculative constructions, cosmologies, ethics, and metaphysics. The Theravada interpretation, on the other hand, (which has come to prominence only recently) suggests that Nāgārjuna neither intended to preclude metaphysics (with a perfect system of reasoning) nor to found a new system of thought. The purpose of the text, so this argument goes, was to counteract certain misinterpretations that had sprung up around the Buddha’s original teaching of anatman (literally «no soul» or «no self»). Simplicity might seem to favour the latter treatment, but to apply Nāgārjuna’s interpretation of anatman (namely, extending it to all entities equally, including dharmas) to the Shravaka Sutras (not to mention the Abhidharmapitaka) would either throw the Theravadin canon into considerable self-contradiction, or call for a thoroughgoing re-interpretation of the Buddha’s original teaching. The Madhyamakakārikā’s ultimate purpose, we should remember, was not to stake out a sectarian position (a «dṛṣṭi», or «view»). Nāgārjuna repeatedly and emphatically states that to make a «fixed view» of his teaching is to miss its point. The purpose of the Madhyamakakārikā’s short course in reasoning is soteriological: to demonstrate the fallacy of clinging to views (or any standpoint whatever, however valid or true) and, in so doing, to remove an obstacle to enlightenment. For this reason it may be described as an «anti-philosophy» as well as a philosophy in its own right. Sarvadṛṣṭiprahānāya yaḥ saddharmamadeśatAnukampām upādāya taṃ namasyāmi gautamaṃI bow to Gautama, who, having taken up compassion, taught the true dharma for forsaking all views. Garfield, Jay L. The Fundamental Wisdom of the Middle Way Oxford University Press 1995 A translation of the Tibetan version together with commentary. Inada, Kenneth K. Nagarjuna: A Translation of his Mulamadhyamakakarika With an Introductory Essay The Hokuseido Press 1970 Romanized text and translation. Kalupahana, David J. Nagarjuna: The Philosophy of the Middle Way State University of New York Press 1986 Romanized text, translation, and commentary. McCagney, N. Nagarjuna and the Philosophy of Openness Rowman & Littlefield 1997 Romanized text, translation and philosophical analysis. Sprung, M. Lucid Exposition of the Middle Way Prajna Press, Boulder 1979 Partial translation of the verses together with Chandrakirti’s commentary. Streng, Frederick Emptiness: A Study in Religious Meaning Abdingdon Press 1967 Translation and considerable analysis. Does anything whatever, anywhere arise. (To say) «Is,» is eternity-grasping; (to say) «Is not,» is a nihilistic view. Therefore, those of discerning vision would not have recourse to Is-ness and Is-not-ness. Where there is neither an addition of nirvana nor a removal of samsara; There, what samsara is discriminated from what nirvana? No «self» or any «nonself» whatsoever has been taught by the Buddhas. Nirvana is like phenomenality, unarisen and unstopping. Or neither actual nor not actual; this is the Buddha’s teaching. Devoid of mental construction, without variation, this is the mark of thatness. Whatsoever becomes dependently, is not insofar, that and only that. Nor is it the other; therefore, it is neither exterminated nor eternal. This is the immortal teaching of the Buddhas, lords of the world. The gnosis (knowledge, etc.) of the independently enlightened Buddhas proceeds without association (with teachings). What is the nature of the thus-gone one (the Buddha), that is the nature of the world. The thus-gone one is devoid of nature; the world is devoid of nature. What is dependent origination, that we call emptiness. There is nothing whatsoever of samsara distinguishing (it) from nirvana. There is nothing whatsoever of nirvana distinguishing it from samsara. Even a very subtle interval is not found of (between) them. When all dharmas are empty, what is endless? What has an end? What is endless and with an end? What is not endless and not with an end? What is «it»? What is «other»? What is permanent? What is impermanent? What is impermanent and permanent? What is neither? There is no dharma whatsoever taught by the Buddha to whomever whenever, wherever. Philosophers Akshapada Gotama | Patanjali | Yajnavalkya | Kanada | Kapila | Jaimini | Vyasa | Nagarjuna | Madhavacharya | Kumarajiva | Padmasambhava | Vasubandhu | Adi Shankara| Ramanuja| More..
Texts Yoga Sutra | Nyaya Sutra | Vaiseshika Sutra | Samkhya Sutra | Mimamsa Sutra | Brahma Sutra | Mūlamadhyamakakārikā | More..